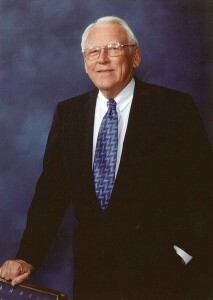 The Man Behind "Mr. Clear Lake"
As President of Alliance Commercial Investments, Inc., a real estate brokerage firm in the Bay Area, Charles L. Whynot has earned a reputation as a visionary in real estate development in the Houston area. But sitting in his office at 900 Apollo Lane in Clear Lake surrounded by memorabilia, letters of gratitude and tokens of recognition for his many accomplishments, Whynot says he is also a man who still enjoys his work. Among the framed photos of presidents – many of them signed in thanks for his support – Whynot’s engaging blue eyes sparkle as he recounts a life filled with savvy business deals, interesting people, community service as well as his passionate interest in politics and the space program. Displayed in a prominent place on his office wall is a large framed certificate from George H. W. Bush and George W. Bush. This and other snapshots of history serve as pleasant reminders to the man affectionately dubbed “Mr. Clear Lake” for his role in the development of the area through his business and personal endeavors. Born in 1925 in Beaumont, Texas and raised by his grandmother, Whynot entered the United States Army after high school and served his country in the second infantry division under General George Patton during WWII, fighting in the Battle of the Bulge. Following his discharge from the armed forces, Whynot launched and ran a successful high-end furniture business in Beaumont for 15 years. An article in the Houston Chronicle announcing plans to build the Manned Spacecraft Center, now Johnson Space Center, prompted him to sell the furniture business and turn his attention to the future development of the Clear Lake Area. That decision marked the beginning. His insight and hard work soon brought retail businesses, offices and homes to the Clear Lake and Nassau Bay areas, including homes for NASA astronauts and executives. Whynot was one of the original home builders to build homes in Nassau Bay. As a matter of fact, Whynot was instrumental as the major facilitator and paved the way for the development of Baybrook Mall, one of the country’s most successful mall properties. Whynot’s noteworthy achievements include being one of the first organizing directors of the Clear Lake Area Economic Development Foundation, the first organizing director of the Clear Lake YMCA where he worked with astronauts to raise funds, starting the Clear Lake chapter of the Palmer Drug Abuse Program in 1978 for teenagers and young adults, and as the first benefactor to establish a scholarship fund at the University of Houston – Clear Lake. A self-proclaimed “space nut,” Whynot says his first trip to Cape Canaveral was to watch Apollo 11 astronauts Neil Armstrong, Michael Collins and Buzz Aldrin lift off the launch pad in July 1969 on their way to the first moon landing. He remains friends with Buzz Aldrin. “I was so involved in the space program that some people thought I was an astronaut,” Whynot said. Alliance Commercial Investments, Inc. is proud to be a part of the 50th Anniversary of the Clear Lake Area Chamber of Commerce. They have helped develop Clear Lake into a great place to do business and live.